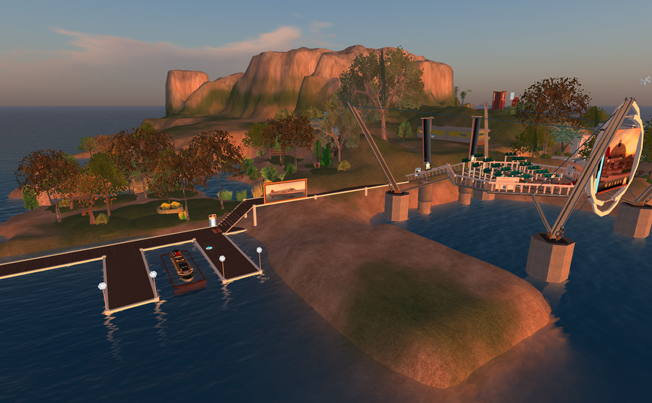 Second Life, the inSL logo and Linden Lab are trademarks of Linden Research, Inc. the blog voyeurism, the podcast ventriloquy, and Raymaker Land Management are all not affiliated with, or sponsored by, Linden Research. my granddad was a very literate person, and cared deeply about education. i have already written about how he founded a school, before the War, in Bandung. in 1973, he published a book: Tour Europe on a Eurail Pass. It described and illustrated his adventures with my grandmother, as the two of them took in the fantastic vistas of Europe, with Malaysia-Singapore Airlines. but that was not the first book he wrote. several decades earlier, as Headmaster and Founder of the Bandoeng English School, he took it upon himself to write the school’s own literacy texts, and Java: a Primary Reader was the result. exactly a year ago, i acquired a copy from a rare books seller in the Netherlands, and donated it to the National Library of Singapore. 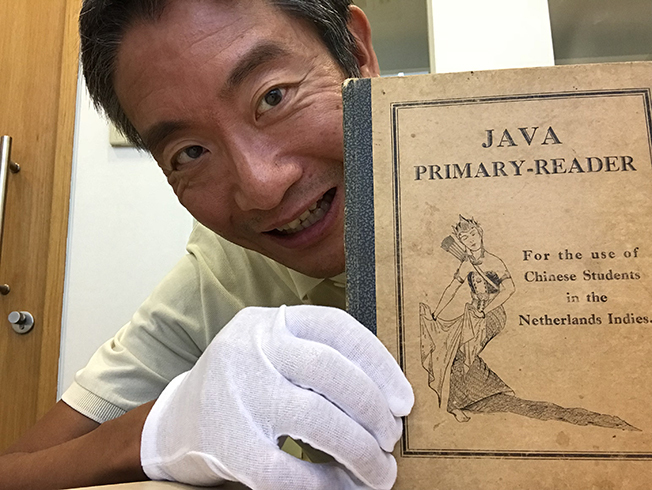 i am very happy to share that it is now part of the Library’s Rare Materials Collection on Level 13 of the Lee Kong Chian Reference Library. i am very happy that the legacy of my granddad - Lim Chong Hum - will live on in this way. Dr Cheah Horn Mun - Assistant Provost, Singapore University of Social Sciences - and i have just had a chapter published in a volume edited by Angela Murphy, Helen Farley, Laurel Dyson and Hazel Jones. 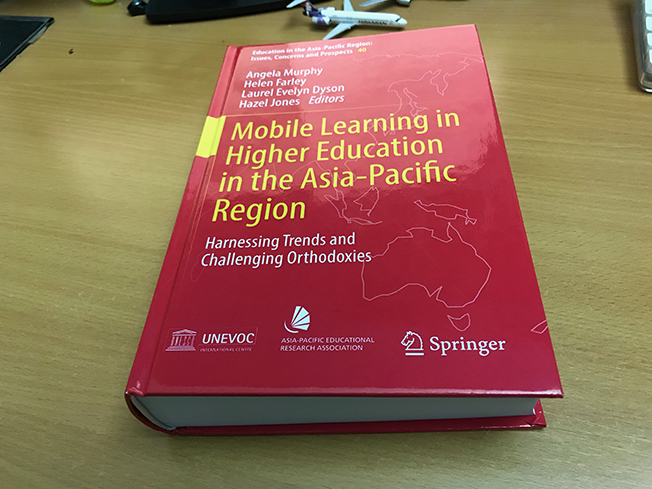 as you can see from the pic, there are quite a number of case studies within Mobile Learning in Higher Education in the Asia-Pacific Region: harnessing trends and challenging orthodoxies. Dr Cheah and i would like to congratulate the editors, and to thank them for their really great suggestions during the writing process of The use of Structured Academic Controversy in a mobile environment to broaden student perspectives and understanding in the social sciences. i would also like to thank my interns Matthew Kho, Song Bing Heng, Hieu Nguyen Vu, for being so patient and diligent. next week, i will be attending the first Regional Meeting of the Asia Research Grant Program, through which my team and i will have the opportunity work with the Vice-Dean for Academics and Student Affairs, at the Faculty of Mathematics and Science Education, at the Universitas Pendidikan Indonesia (Education University of Indonesia). over the course of 2016 and 2017, my team and i will be working with schools from across the Indonesian archipelago - God willing - as we collaborate with teachers from urban and peri-urban contexts on designing STEM curriculum using our Maker Motes approach. for me, this collaboration means a great deal, because ninety years ago, my grandfather moved from Penang to Java to become an English teacher. his first posting was at a school in Semarang. according to my aunt, granddad used to hike around the area with an English colleague. in the early 1930s, granddad decided to start his own school, and he moved his young family to Bandung. the Bandung English School moved from site to site as it expanded. the second site was in Lengkong. the third and final site was along what was known as the Grote Postweg (Jalan Raya Pos / Jalan Asia-Afrika, today) and had two wings, a compound in front, a large reception hall, and classes were held at the back. one of the wings was the residence of my family, while the other wing housed the boarders. the school employed a diverse variety of the local Javanese, including a cook. grandmother pitched in too, both as a primary school teacher and as the keeper of the accounts. she picked up quite a few recipes from the cook :-) my great-grandmother was also part of the family there, and when she died she was buried in Cikadut. it was in Bandung that my father was born in 1939. granddad would take his children every week to a government building to read the Dutch newspapers, and would doubtless have been keeping a close eye on the events of the Second World War. when the war came to Java, granddad closed the school, sent the boarders home, and found a smaller house not too far from the site of the school, where the family lived until after the war. Explore archived materials from the major poets of World War I, such as Wilfred Owen and Siegfried Sassoon. 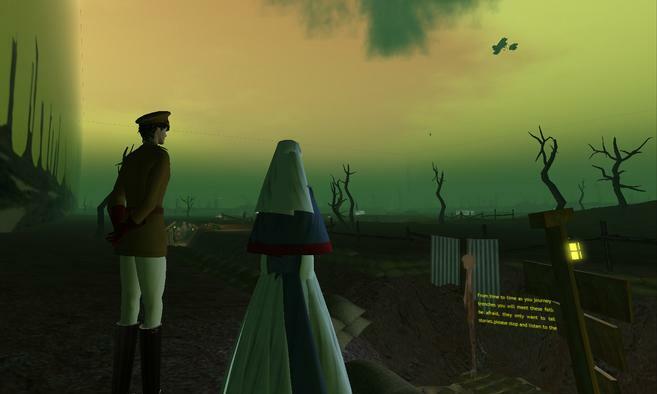 Manuscripts, letters, and diaries are supplemented with streaming video and audio to provide an incredible insight into life in the trenches during 1914-1918.
every once in a while, one comes across an installation in Second Life which enervates you, inspires you, and gets your mind going on all sorts of generative tangents. it's very late in my time-zone now, but even if i had hours, i wouldn't be able to do justice to what a team from Oxford have done, in their interpretation of historical narratives of the Great War. 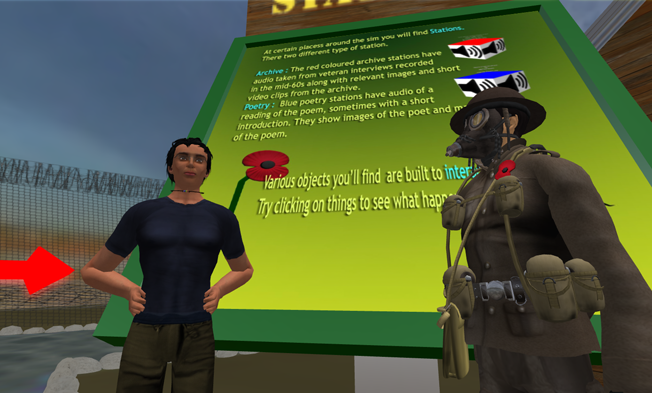 if you're new to Second Life and have time to visit only one place in depth, you could do far far worse than visiting the First World War Poetry Digital Archive. 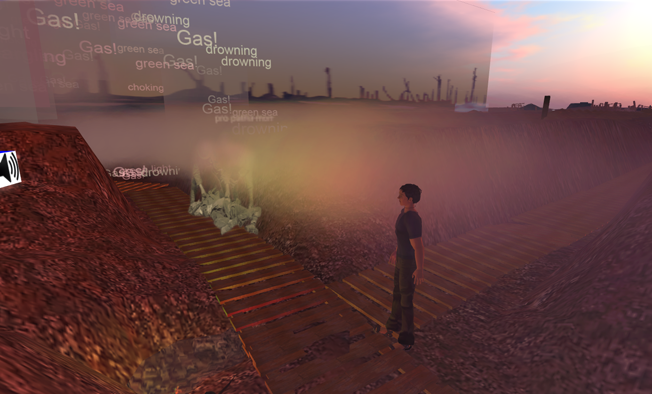 it's a long name for what is truly a game-changing experience for fictive worlds, oral history, multisensory new media and theorizations on projective identity. my grateful thanks to Skanda Broek (that's him in full garb below) and CSteph Submariner, for their warm welcome the minute i rezzed in the region. 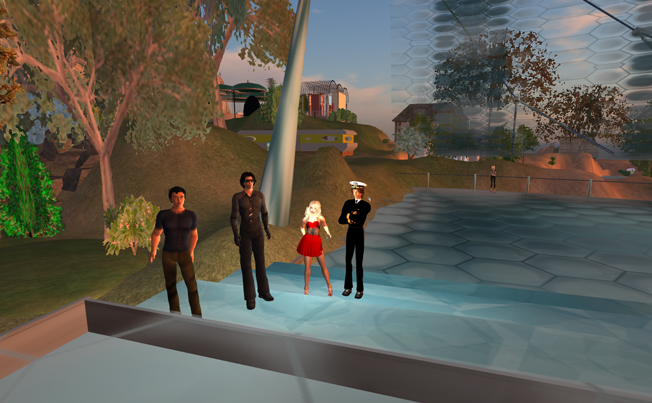 the one-hundred-and-seventy-third episode of ventriloquy features the creative genius of one of the most celebrated architects in Second Life - Scope Cleaver. Scope has totally re-interpreted the space at Clementina, that i first introduced to you just last month. in this 1.6 MB download, i describe how - in his own inimitable way - he has designed a place where visitors to the SS Galaxy will have more than an excuse to linger, even before embarking aboard the ship herself. i am so pleased with the result, that i have renamed the SS Galaxy - Continental Terminal, as the SS Galaxy Continental Terminal by Scope Cleaver. the one-hundred-and-seventy-first episode of ventriloquy introduces the SS Galaxy - Continental Terminal. 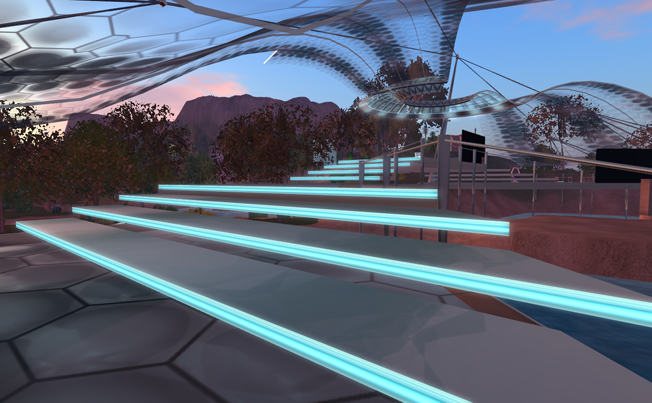 designed as a place where residents new to Second Life can feel welcome, the SS Galaxy - Continental Terminal is located in the historic sim of Clementina, halfway between Governor Linden's mansion and the Ivory Tower of Primitives (the latter being in Natoma). 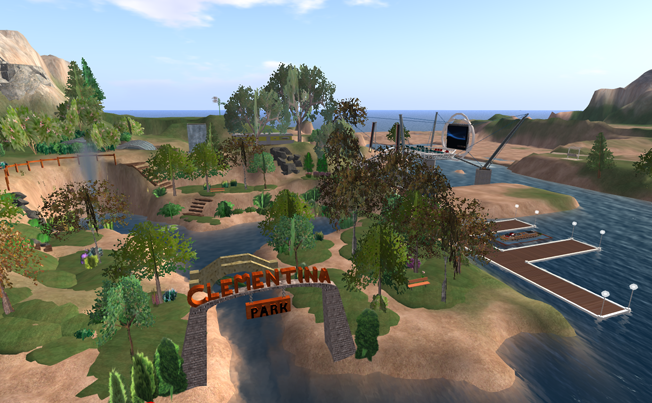 specifically, the SS Galaxy - Continental Terminal is directly adjacent to Clementina Park, and the public sandbox at Natoma. i open the year with the one-hundred-and-sixty-sixth episode of ventriloquy, in which i share with you the news of the re-opening yesterday of St Michel - the Jules Verne Museum! 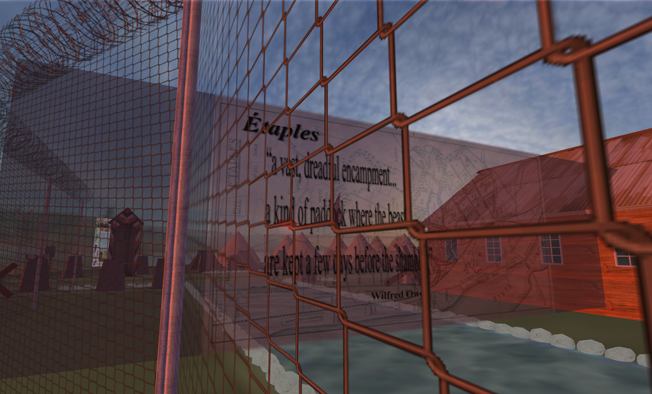 those of you who have been following this blog for some time would perhaps recall that in July 2007, in episode 117, i introduced St Michel - the Jules Verne Museum as the first facility of its size in Second Life to honour the life and creative works of Jules Gabriel Verne. the museum remained open for fourteen months, and was featured in the March 2008 issue of Deja Vu International magazine. over the past four months, i have been looking for a new site to rebuild the museum. 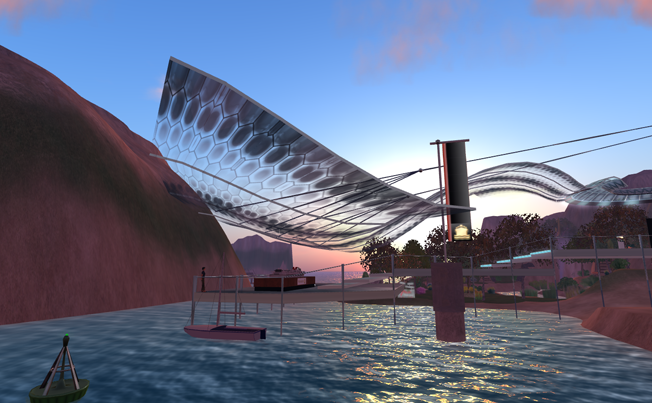 i finally found such a site at Lily, in the Lost Lakes region of the original Linden mainland continent of Sansara. 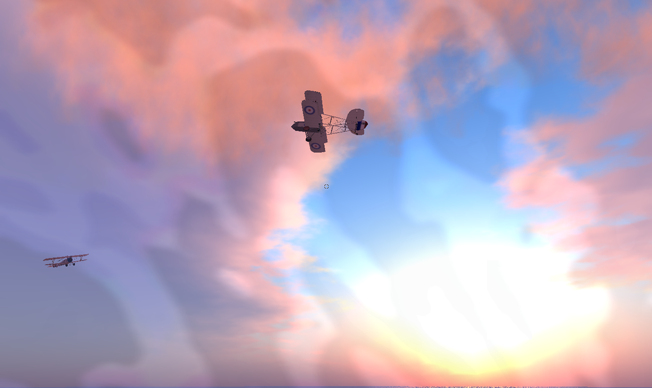 after five days of feverish work with valued help from Kirstenlee Cinquetti and Felixx Shepherd (during which time i also designed and opened the nearby Lily Airstrip and Lily Beach), i was extremely pleased to be able to let the general public start visiting the museum from New Year's Day 2009! God has blessed me with very many moments in my life which have been memorable, and even so very few of them rank up there with what i experienced today, listening transfixed to the live broadcast of the president-elect's victory speech on the BBC World Service, with a frappuccino in hand but barely taking a sip from it. 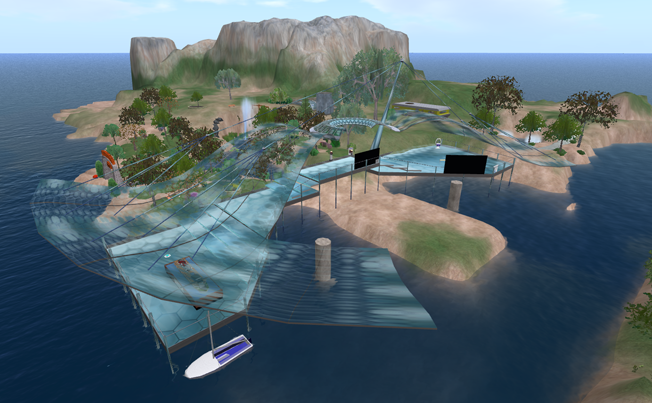 Nautilus City (not to be confused with the continent of Nautilus) is the most recent landmass on the Linden mainland. word first leaked out of its existence after the intrepid explorer Magellan Linden surfaced from beneath its bowels in his bespoke Mole Tank. earlier today, i managed to secure ownership of the plot of land nearest to where the abandoned Mole Tank lies. the plot is directly across the Great Canal.